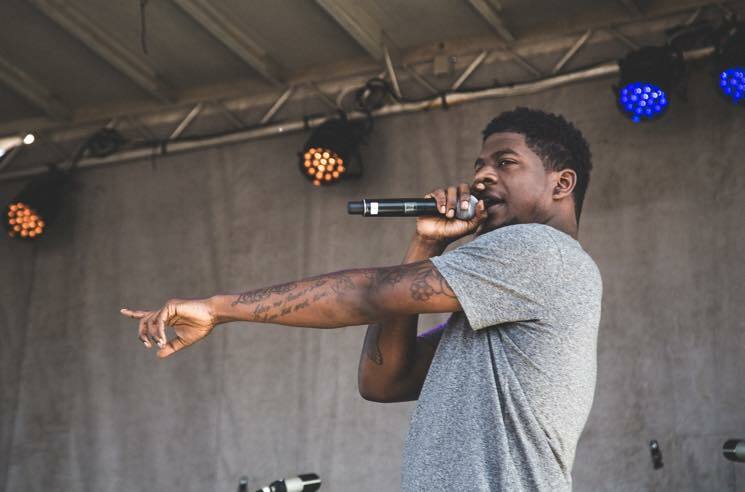 In the unforgiving heat of the day, with the sun slamming down on the all-asphalt venue of the Port Lands, Mick Jenkins urged the crowd to drink more water. Wise advice on a sweltering afternoon, for sure, but he was being metaphorical. "Drink more water" is the South Side Chicago MC's mantra, his message. Water is truth, and he wants us to thirst for it. A cluster of about 100 fervent truth-seekers quadrupled over the course of Jenkins' 50-minute set, which was punctuated with the best joints from his recent Waves[s] EP and 2014's breakthrough mixtape The Water[s]. The sun couldn't sap the crowd's bouncy energy as the lanky Jenkins — backed by a DJ, drummer, and singer the Mind — destroyed his Missy Elliot flip "The Rain" and incredible ode to Montreal, "514." Jenkins gives off a much warmer vibe live than on the often icy tone of his mixtapes, and it left the growing congregation demanding an encore that never arrived.